Even though the Recreational Island has been designed for the super yacht industry, it has many more applications that are limited only by your imagination. We are also currently investigating the option to configure the island for use as a portable helicopter landing platform. This option would significantly extend a superyacht's facilities without the need to sacrifice valuable deck space. What if the next hotel you stayed in had an Island and allowed you to hire it out for the day to really have your own space, rather than being with the crowds around the beach... 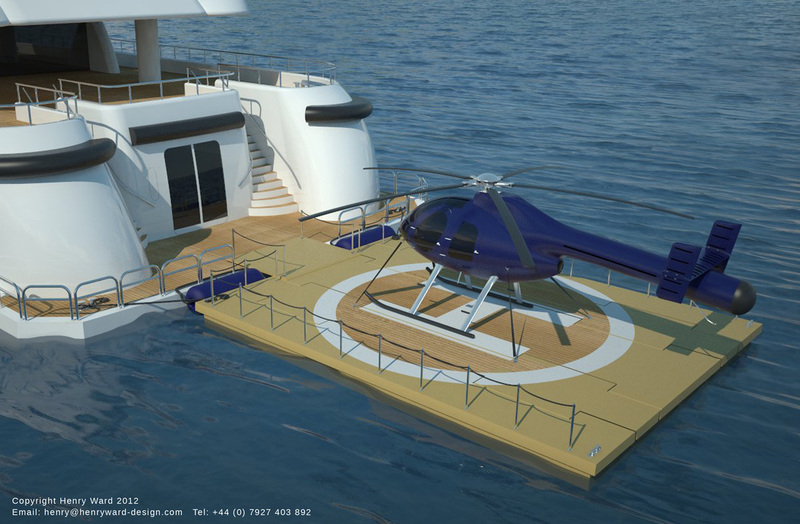 If the Recreational Island was configured as a portable helipad, guests could also be flown in / out. The Recreational Island may also be kept on a mooring by a waterside house, so if landing space is limited it would allow you to fly in when required, or simply be used for recreational activites. We believe the Recreational Island would be an important product for the armed forces as it can be used as a mobile helipad, useful when there is nowhere to land when dropping off evacuees for example. Coast and life guards could also use the Recreational Island as a base on the water to be nearer potential emergencies out at sea. A key area would be busy seaside resorts.